The classic film “It’s a Wonderful Life” charms folks every year at Christmas time. Who can resist the charm of Bedford Falls and the folks who come to the aid of desperate leading citizen George Bailey, including Clarence an angel in search of his wings? The Frank Capra movie somehow doesn’t make the transition to stage, however, in A Wonderful Life, getting a run at Goodspeed, despite its popularity and the talented music/lyric team of joe Raposo and Sheldon Harnick (who also wrote the book and few others like those for the musicals Fiddler on the Roof, She Loves Me,and Fiorello! to name few). You’ll probably know Raposo best for his work on TV’s “Sesame Street,”for which he wrote the theme song, as well as classics such as "Bein' Green" and "C is for Cookie." You won’t remember any of the Wonderful Life score, unfortunately. No catchy tunes to hum on the way out of the theater here, despite the efforts of the orchestra, directed by Michael O’Flaherty to make the songs sound good, even if they appear to have been inserted so the tale could be called a musical. In fact, a lot of them include cacophonous moments (orchestrations by Dan DeLange) so that even the Bailey kids singing a simple song doesn’t sound quite right. In case you haven’t watched the film, starring Jimmy Stewart and Donna Reed a couple of hundred times, the story follows the life of George Bailey (Duke Lafoon), who always wanted to escape small town Bedford Falls, but finds himself stuck running the family savings and loan business when his father dies. He gives his chance for a college education to his younger brother, Harry (Logan James Hall) and eventually settles down with Mary Hatch (Kirsten Scott) who always has dreamed of marrying him and raising a family in a big, old abandoned house in town. Their loans were turned down by town boss Mr. Potter (Ed Dixon, who is so villainous that he gets booed at the curtain call) who hopes to put his only competitor, the Bailey Savings and Loan, out of business. He seizes on a mistake made by George’s Uncle Billy (Michael Medeiros) and suddenly George is missing a lot of money and facing financial ruin. He realizes that he is worth more dead than alive and considers suicide to bail out his family. Enter guardian angel Clarence (Frank Vlastnik), who must help George realize that his life is wonderful – and in the process, earn his wings as a full angel. Somehow the feeling of Bedford Falls is never captured here, so we don’t experience the transition to what life might have been like had Gorge never been born. Lighting by Scott Bolman helps create a dark look – and costumes by Jennifer Caprio help do the same and pace us in the time periods – but the set designed by Brian Prather is pretty bleak and nondescript for both versions of the town. Perky choreography by Parker Esse helps establish a joyful mood for Bedford Falls, but Director Michael Perlman doesn’t define it. Some changes are made in the story to adapt the film to stage: There’s no dance intothe high school swimming pool and Clarence doesn’t save George from a fall from a bridge, but pushes him instead out of the way of an oncoming train. And Clarence is an effeminate, meek, rather than rotund, bumbling angel-in-training. There are a few funny lines, and the heartwarming story of friends rallying to payback kindnesses still brings a smile, but overall, this musical lacks the charm of the movie and has us kind of wishing Clarence could transport us into the film. 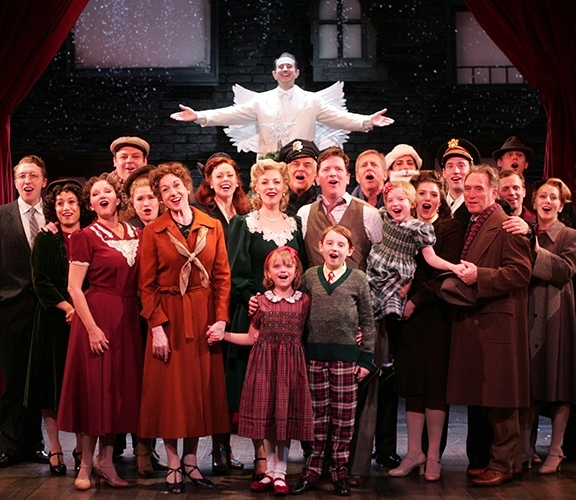 A Wonderful Life offers extended angel wings through Dec. 6 at Goodspeed Opera House, 6 Main St., East Haddam. Performances are Wednesday at 2 and 7:30 pm; Thursday at 7:30 pm. (with select performances at 2 pm), Friday at 8 pm; Saturday at 3 and 8 pm; Sunday at 2 pm (with select performances at 6:30 pm. Tickets $27-$80.50 (860) 873-8668; www.goodspeed.org.